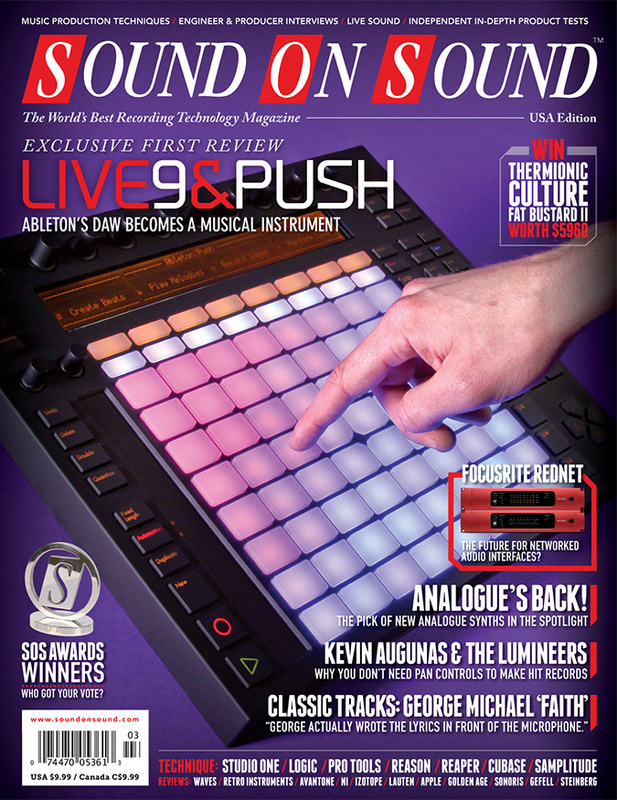 Live 9 has been a long time coming, but, along with Ableton’s new Push controller, has the potential to revolutionise music-making. ART produce an impressive number of inexpensive problem-solving boxes, one of which is the Dual RDB reviewed here. A rotatable capsule design means that making stereo recordings with the CK40 could hardly be easier — but how does it sound? These compact speakers approach the performance of HK’s higher-end systems, but at a surprisingly modest price point. As loudness standards evolve, so we need new metering plug-ins. Izotope’s suite covers all the bases. German manufacturers Microtech Gefell share origins with Neumann and make some of the best mics currently available. Does that pedigree come through in their first preamp? Frequency plot, internals and tech specs to accompany the main product test. NI’s Session Horns forsakes the cinematic to focus on a real-world brass section that’s well suited to pop and rock music. An often overlooked part of the orchestra gets the royal treatment in a new sample library. This recreation of a Bill Putnam classic brings back to life the qualities of a long-gone era — and does so in a truly uncompromising fashion. Sonoris’s innovative plug-in designs prove that not all digital equalisers sound the same. Guitar processor from US-based stomp-box manufacturer. Waves’ latest analogue emulation has unrivalled pedigree. But is there still a role for a mixer that was declared obsolete 40 years ago? Whether you’re a performer or an engineer, these simple feedback-reducing tips should ensure your gigs remain free from squeaks and howl-rounds! As he gets to grips with another reader’s track, our mix engineer shows that distortion can often be as useful as EQ in sculpting sound sources. Steinberg’s Padshop can be used to create excellent rhythmic effects. Make use of the many benefits of stem mixing in Studio One. We visit the home studio of TV composer Kate Ockenden and discover that optimising monitoring needn’t require acres of acoustic foam. Now that Rack Extensions are here, there are lots of Reason synths on offer — but which are the best? Often overlooked, EXS24 is a very valuable feature of Logic. So why and how should we be using it? This month Mike Senior discusses Kanye West, Jake Bugg, Amy Macdonald, Plan B and ABBA. Pro Tools 10 has some new ways to help you move material to and from other systems — including older Pro Tools rigs. Wham! went their separate ways in 1986, but the triumph of George Michael’s debut album Faith in 1987 meant that the success of his solo career was never really in doubt. Would you hire a mixer who doesn’t believe in panning? The Lumineers did — and were rewarded with a hit album. This month we feature: Straw Bear, The Neo-Kalashnikovs, Ken Nicol, Gibson, Gillie Nicholls, The Star Fields and Christopher Holland. Write, record and release a song today! Editor In Chief, Paul White tells all. Cochlear implants help the profoundly deaf experience sound. But can users overcome the limitations of the technology to understand music? Q. Are wow and flutter key to that analogue tape sound? Read more about Q. Are wow and flutter key to that analogue tape sound? Q. How can I easily match levels on MP3s? When I listen to MP3s on a PC or Apple Mac, they are all at different levels, with the louder ones seeming twice as loud as the quietest ones. Read more about Q. How can I easily match levels on MP3s? It’s time media composers stood up for themselves — and their art. Media content for the March 2013 issue.